Sergei Bobrovsky (CBJ - 72) and Nick Foligno (CBJ - 71) share a winning hug. Former Nashville Predator Scott Hartnell (CBJ - 43) celebrates his empty net goal with Kevin Connauton (CBJ - 4) and Cam Atkinson (CBJ - 13). 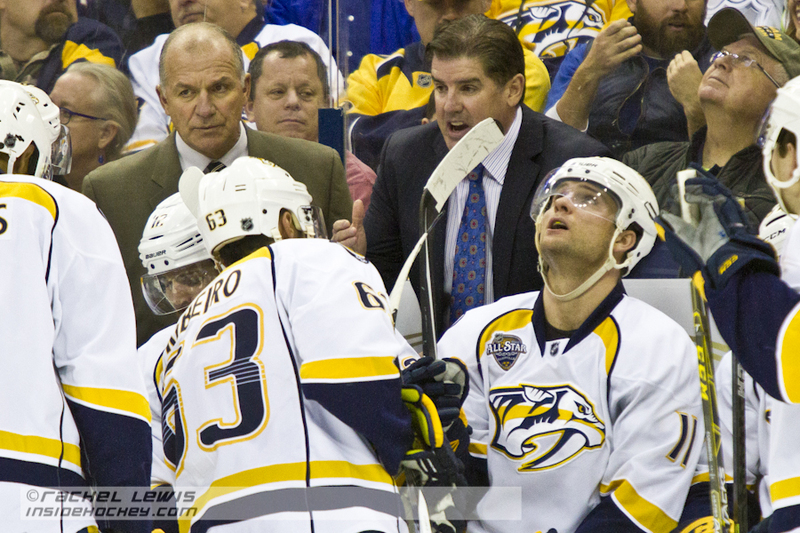 Nashville head coach Peter Laviolette addresses his team during a timeout. 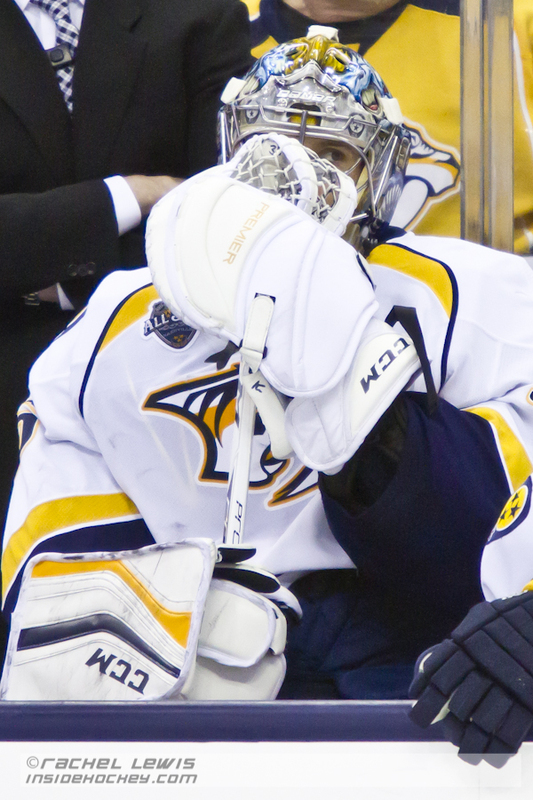 Pekka Rinne (NSH - 35) keeps an eye on Nashville's empty net. Shea Weber (NSH - 6) knocks William Karlsson (CBJ - 25) off his feet. Craig Smith (NSH - 15) knocks Jack Johnson (CBJ - 7) off the puck. Mike Fisher (NSH - 12) skates out of the Nashville zone. 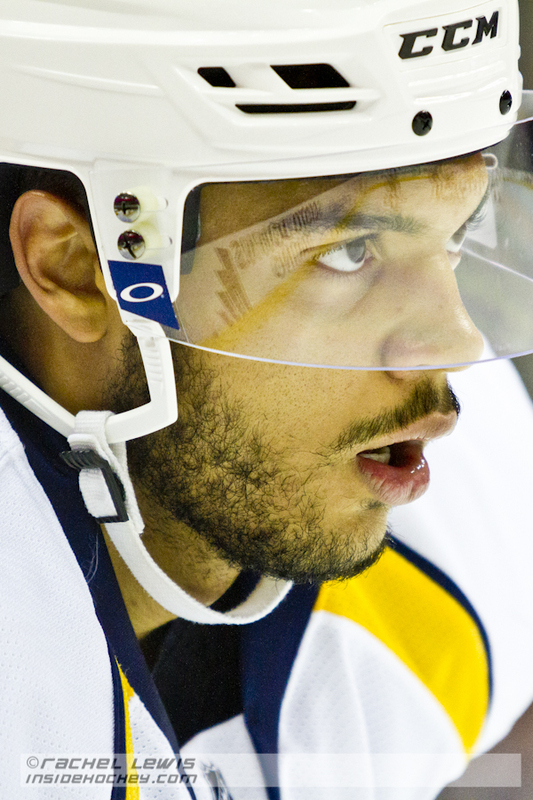 Seth Jones (NSH - 3) awaits the faceoff. Sergei Bobrovsky (CBJ - 72) readies for the faceoff. Ryan Ellis (NSH - 4) keeps the puck away from Cam Atkinson (CBJ - 13). Gregory Campbell (CBJ - 9) skating in for the check. 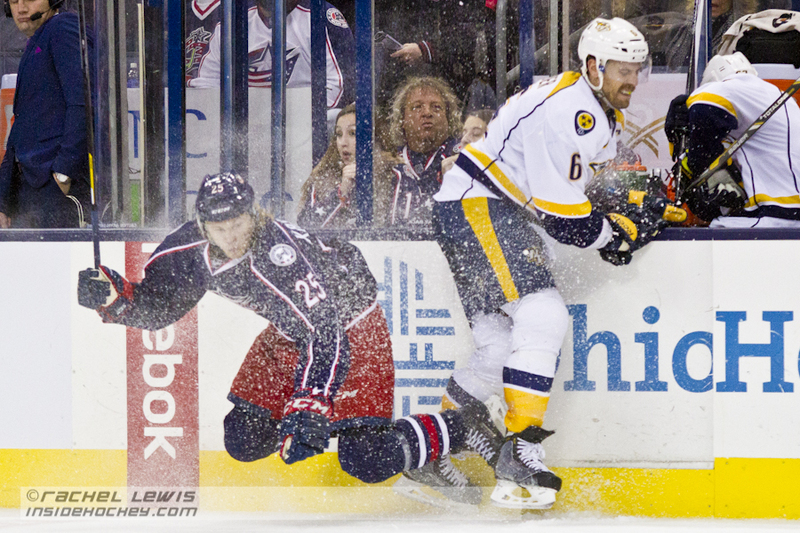 Ryan Johansen (CBJ - 19) tries to knock over Filip Forsberg (NSH - 9). Pekka Rinne (NSH - 35) readies for the faceoff. Colton Sissons (NSH - 84) knocks Cam Atkinson (CBJ - 13) off his feet. Pekka Rinne (NSH - 35) awaits the faceoff. 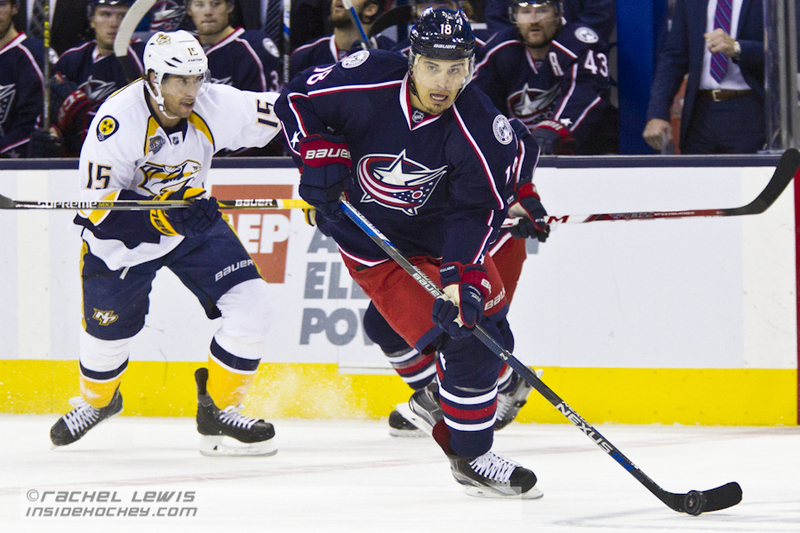 Rene Bourque (CBJ - 18) skates the puck into the Nashville zone. William Karlsson (CBJ - 25) skates the puck into the Nashville zone. Gregory Campbell (CBJ - 9) scores a goal against Pekka Rinne (NSH - 35). Ryan Ellis (NSH - 4) sports a handlebar mustache for Movember. Roman Josi (NSH - 59) has a laugh during warmups. 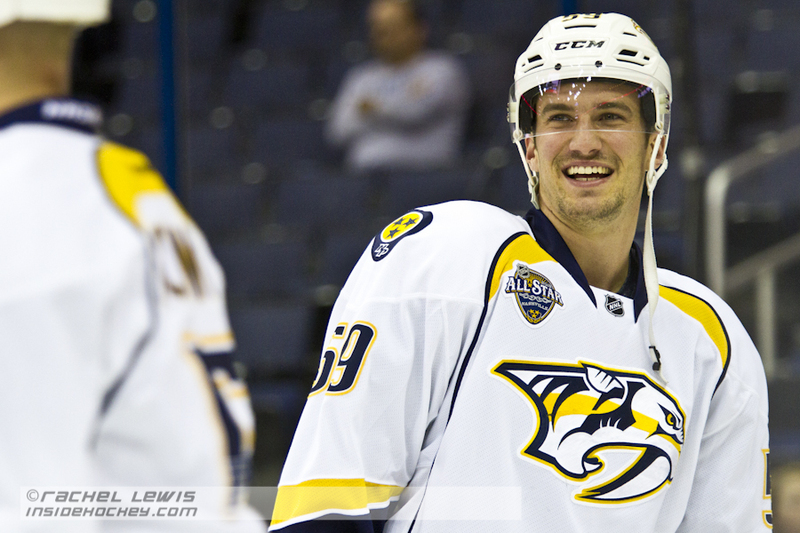 Roman Josi (NSH – 59) has a laugh during warmups. 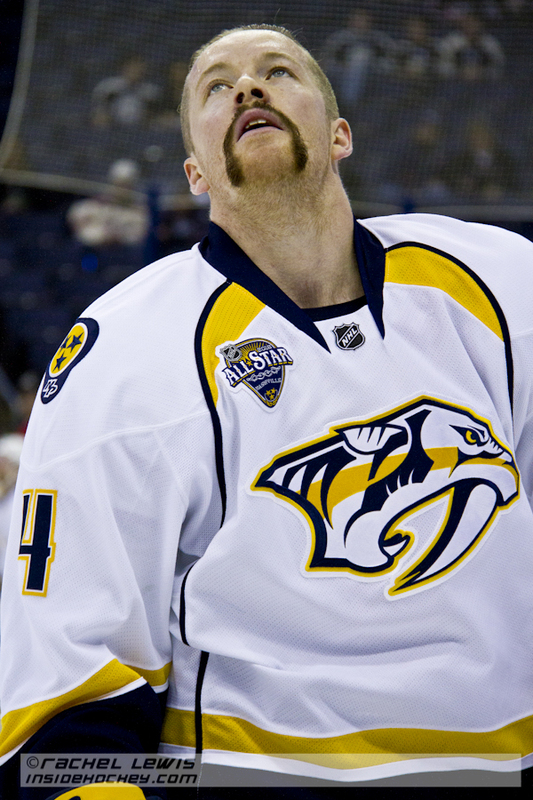 Ryan Ellis (NSH – 4) sports a handlebar mustache for Movember. 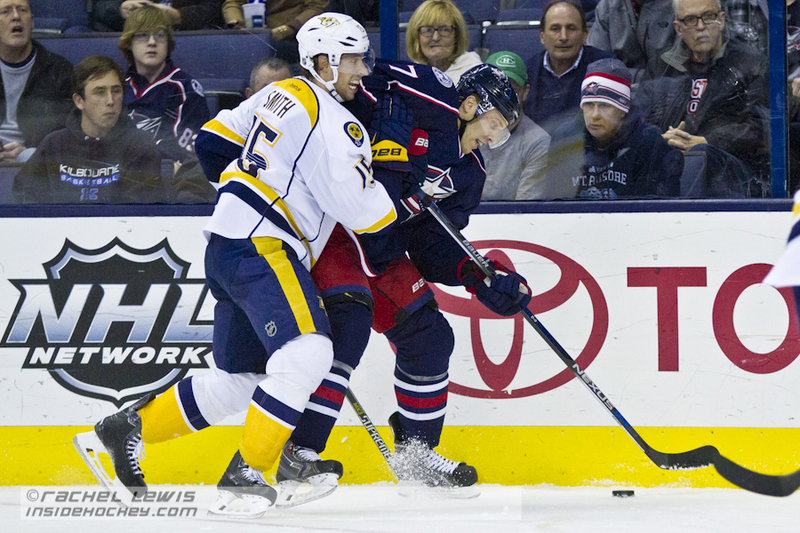 Gregory Campbell (CBJ – 9) scores a goal against Pekka Rinne (NSH – 35). 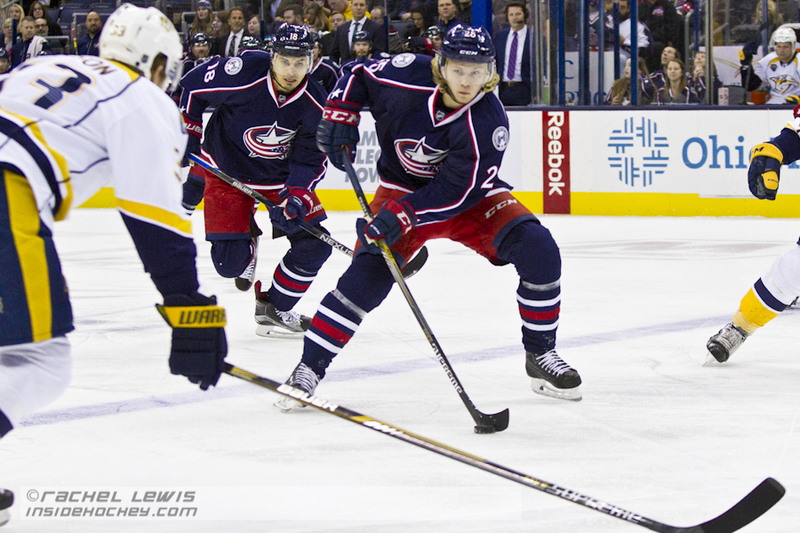 William Karlsson (CBJ – 25) skates the puck into the Nashville zone. 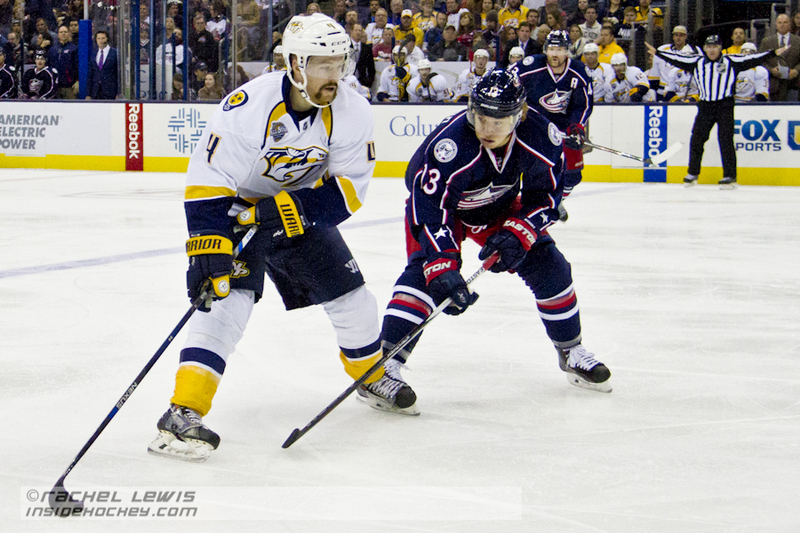 Rene Bourque (CBJ – 18) skates the puck into the Nashville zone. 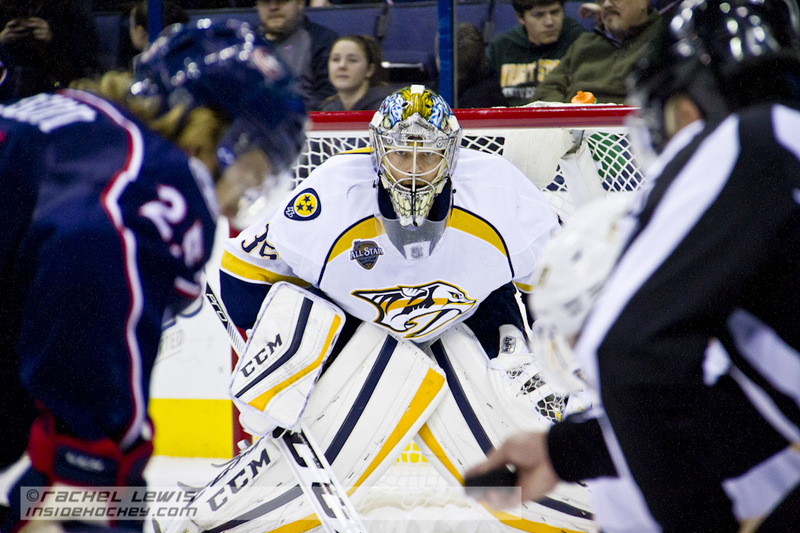 Pekka Rinne (NSH – 35) awaits the faceoff. 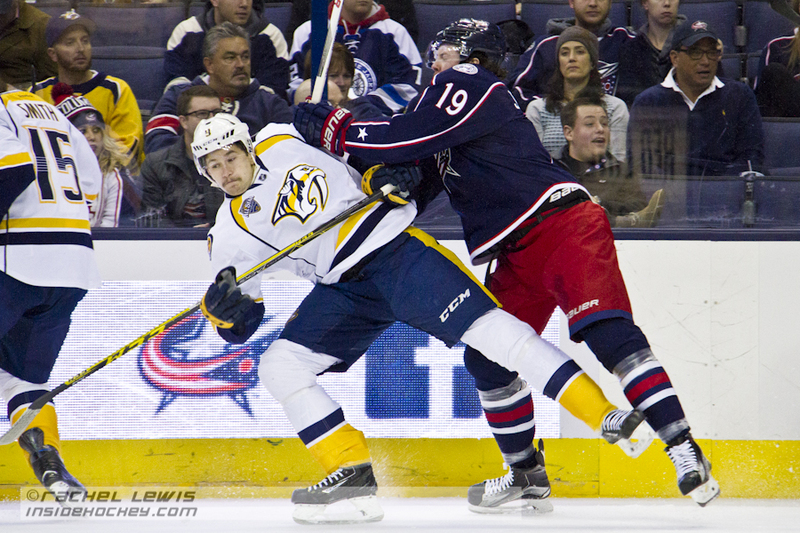 Colton Sissons (NSH – 84) knocks Cam Atkinson (CBJ – 13) off his feet. Pekka Rinne (NSH – 35) readies for the faceoff. 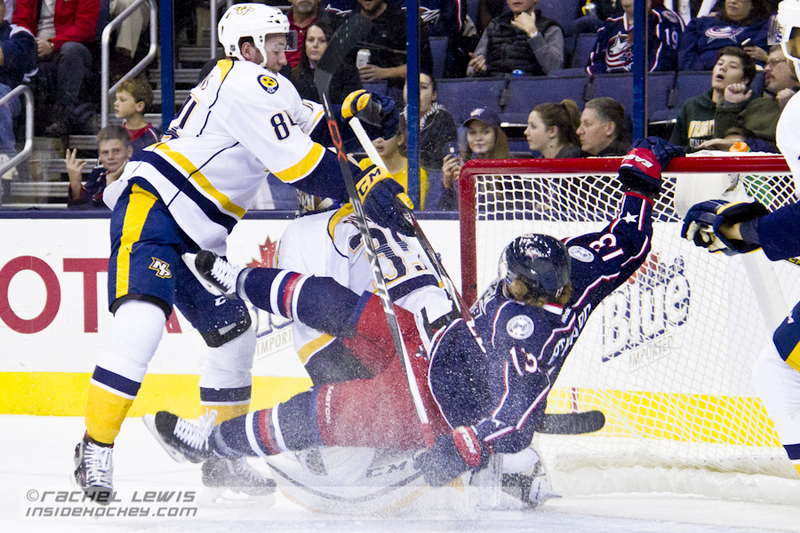 Ryan Johansen (CBJ – 19) tries to knock over Filip Forsberg (NSH – 9). Gregory Campbell (CBJ – 9) skating in for the check. 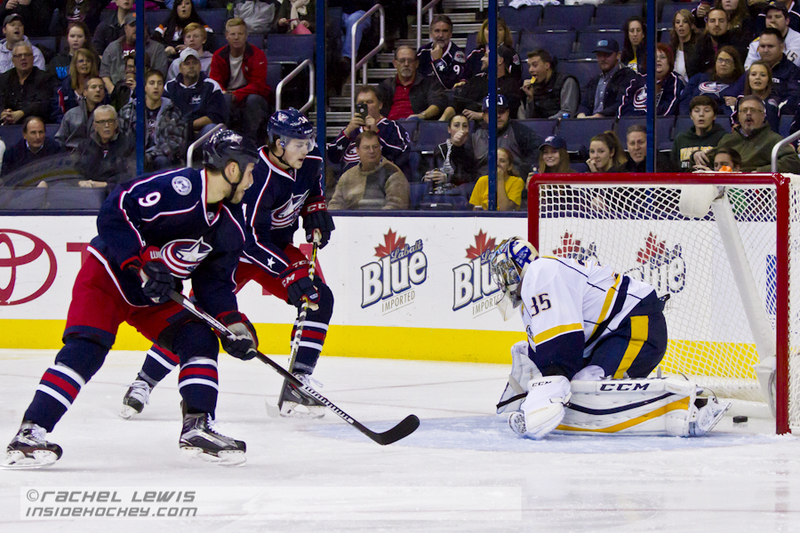 Ryan Ellis (NSH – 4) keeps the puck away from Cam Atkinson (CBJ – 13). 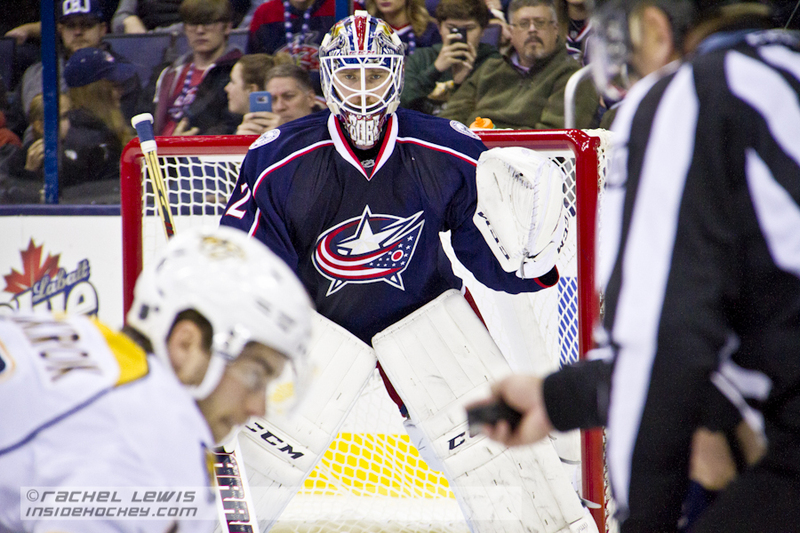 Sergei Bobrovsky (CBJ – 72) readies for the faceoff. 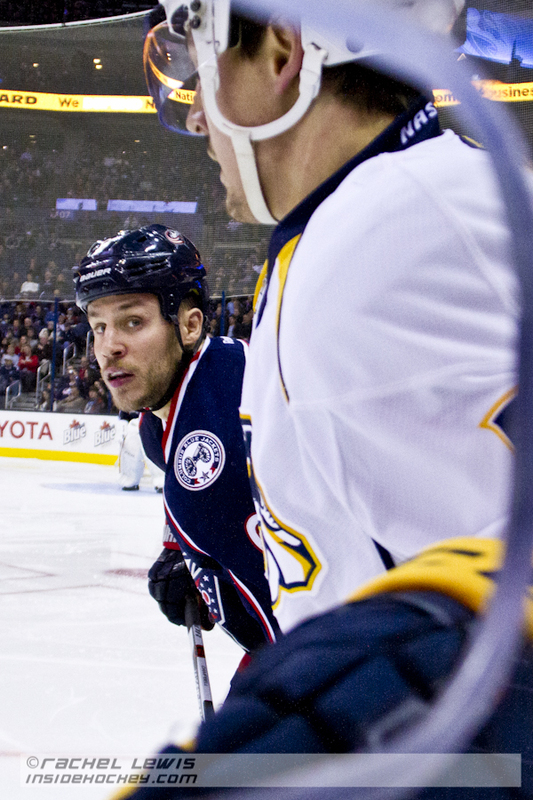 Seth Jones (NSH – 3) awaits the faceoff. 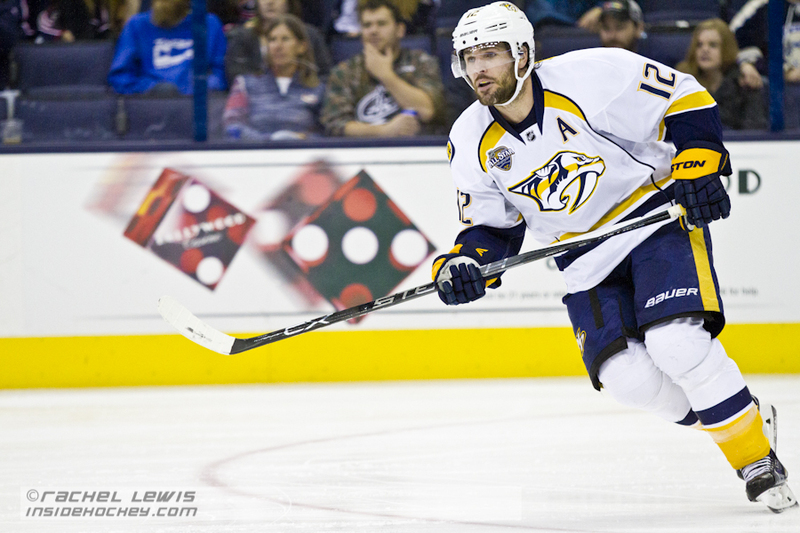 Mike Fisher (NSH – 12) skates out of the Nashville zone. Craig Smith (NSH – 15) knocks Jack Johnson (CBJ – 7) off the puck. Shea Weber (NSH – 6) knocks William Karlsson (CBJ – 25) off his feet. 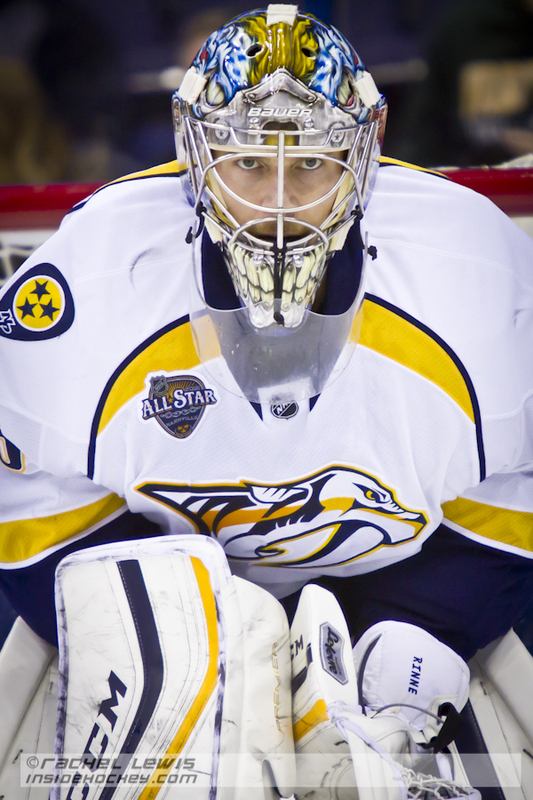 Pekka Rinne (NSH – 35) keeps an eye on Nashville’s empty net. Former Nashville Predator Scott Hartnell (CBJ – 43) celebrates his empty net goal with Kevin Connauton (CBJ – 4) and Cam Atkinson (CBJ – 13). Sergei Bobrovsky (CBJ – 72) and Nick Foligno (CBJ – 71) share a winning hug.